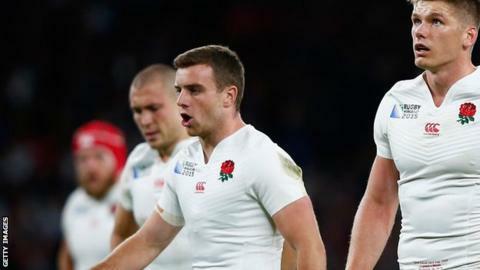 George Ford is sure England's players are good enough to win trophies in the future despite their World Cup failure. Stuart Lancaster's side are the first host nation not to qualify for the tournament's knockout stages. "Definitely we'll get it right in the future. This is a great bunch of lads," said the Bath fly-half, 22. Ford, replaced by Owen Farrell for defeats against Wales and Australia, returns for England's final Pool A match against Uruguay on Saturday. His omission from the first two games was one of a number of decisions that raised questions as to whether England backs coach Andy Farrell - Owen's father - was having an undue influence on tactics and team selection. Farrell denied those suggestions. Meanwhile, Ford's father Mike, a former England assistant who is head coach at Bath, has called for a swift inquest into his country's early World Cup exit. Ford junior will return to Bath on Monday, following the match against Uruguay in Manchester, and wants to return to Premiership rugby as quickly as possible. "I'm going to go straight back in - I think most of the other Bath boys are as well - just mainly because I want to carry on playing rugby," he said. "If I got away from it for a week, all I'd probably do is sulk anyway. I'll crack on and go back training every day and hopefully get a good start to the season with Bath."